Six students were recognized for outstanding achievement in various fields of study for the 2017-18 academic year during a special community worship service at Samford University’s Beeson Divinity School April 26. 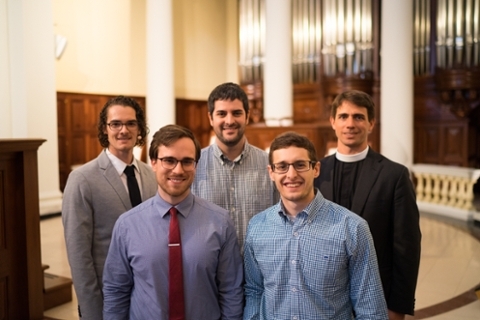 Four students, who will graduate May 4 with Master of Divinity (M.Div.) degrees, received awards. Ben Crocker received the James Earl Massey Student Preacher Award for excellence in preaching. He preached the sermon during the April 26 worship service entitled, “The Nearness of the Knower” based on Psalm 139. Jacob Catlett received the History and Doctrine Award in recognition of his exemplary scholarship in historical and systematic theology. Yannick Christos-Wahab received the William M. Todd Award for Biblical Languages in recognition for his mastery of biblical languages. Cris Harper received the Pastoral Ministry Award for his outstanding achievement in the study of pastoral theology and practice of pastoral ministry. One student, who graduated in December with an M.Div. degree, received an award. Steven Breedlove received the Most Distinguished M.Div. Student Award in recognition of his outstanding and holistic achievement in scholarship, Christian spirituality and ministry involvement. One other award was given to a nongraduating student. First-year M.Div. student Russell Mann received the Mathews-Thielman Scholarship Award, given in recognition of exemplary Christian character and acumen in biblical studies. The award was established several years ago in honor of two professors, Frank Thielman and Ken Mathews, for their 25th anniversaries at Beeson Divinity School. Watch Crocker’s sermon and the award presentations on Beeson’s YouTube channel.